Aspergillus is a genus of ubiquitous saprophytic fungi normally found in soil, decaying vegetation and dust. Although there are more than 1000 Aspergillus species, only Aspergillus niger, A. fumigatus and A. flavus are pathogenic. Invasive Aspergillosis is a common fungal infection in patients with hematological malignancies. Because Aspergillus species are angioinvasive, they frequently disseminate from the lung to other organs via the hematogenous route. 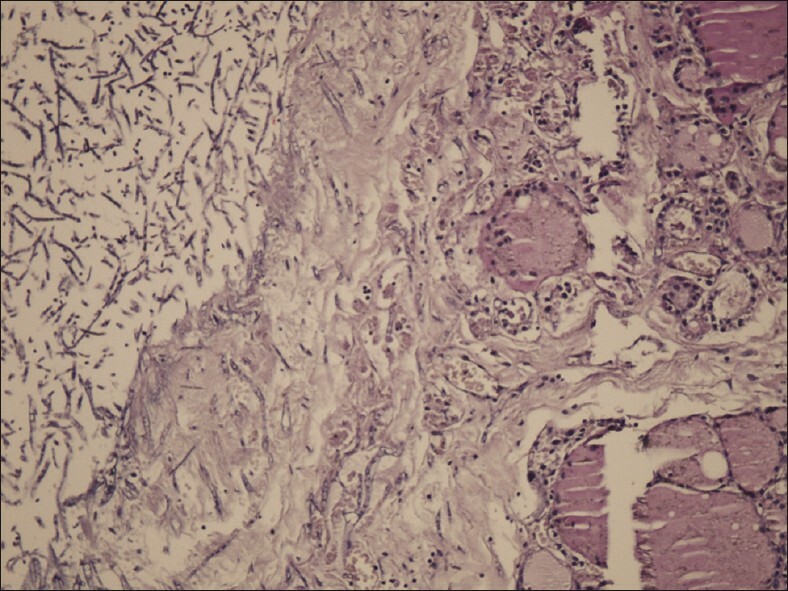 Extrapulmonary involvement occurs at an advanced stage of invasive Aspergillosis, and is ominous. We report a patient with multinodular goiter and semi-invasive Aspergillosis of the thyroid. A 35-year-old woman presented with a thyroid mass, weakness and shortness of breath of 3 years duration. Examination revealed a diffusely enlarged thyroid gland with multiple nodules. The patient farmed and raised livestock. In December 2009, she was admitted to our hospital with an enlarging neck mass. Fine-needle aspiration (FNA) and ultrasonography were not performed. She underwent surgery with a working diagnosis of multinodular goiter. Macroscopic examination of the surgical specimen revealed a dark brown lobulated nodular goiter with a total thyroid weight of 85 g. The two lobes measured 6 cm × 5 cm × 4 cm and 4 cm × 3 cm × 3 cm. The surface was soft and dark brown. 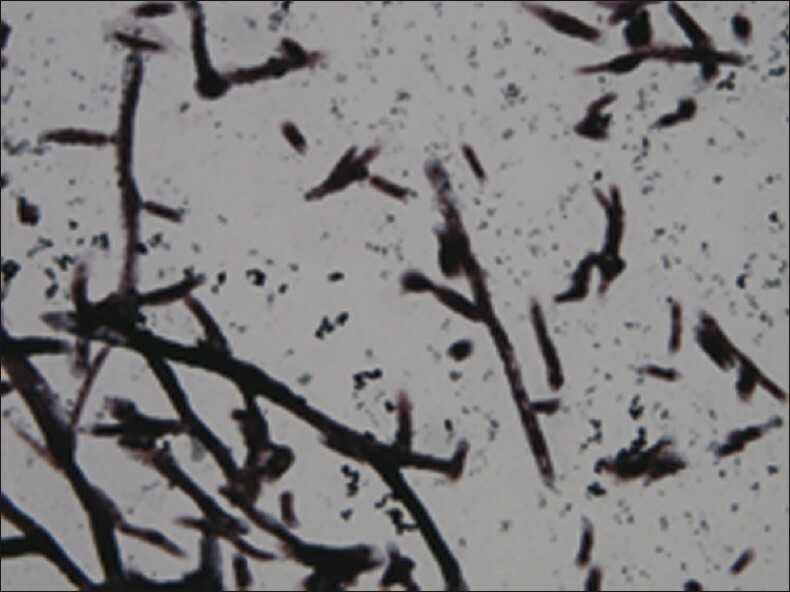 Microscopically, periodic acid Schiff-positive [Figure 1] and silver methenamine (PASM)-positive hyphae that divided at 45° into branches and conidia were detected next to the thyroid capsule, with conidia in the cystic nodule [Figure 2]. Moreover, focal ischemic changes in the thyroid tissues were observed. There were no multinuclear giant cells, eosinophils, microabscesses or granulomatous reaction. The physical examination was normal, with no signs of immunosuppression. The thyroid function test results were T3 2.46 pg/ml, T4 1.14 pg/ml and TSH 40.7 μIU/ml. The hemogram was normal. Post-operative blood culture was negative for any fungal organism. Fungal infection of the thyroid is extremely uncommon. Most reported fungal infections of the thyroid have occurred concurrently with systemic infections in immunocompromised hosts, some of which had a pre-existing thyroid disease. , The index case reported by Berger et al. had no pre-existing thyroid disease; however, it was a post-LURRAT recipient with increased susceptibility to various kinds of infections. A recent review by Goldani et al. described Aspergillus as the most common fungal infection of the thyroid. In this case, conidia were detected next to the thyroid capsule, with conidia in the cystic nodule [Figure 3]. This feature has not been reported earlier. Most thyroid lesions of invasive Aspergillosis are described as focal abscesses, patchy hemorrhagic lesions due to vascular invasion or diffuse necrotizing thyroiditis. In patients with thyroid Aspergillosis, local inflammation and direct tissue destruction caused by invasive Aspergillosis of the thyroid can cause thyroid hormones to leak into the bloodstream, sometimes leading to thyrotoxicosis. Our patient was asymptomatic, with a T3 of 2.46 pg/ml, T4 of 1.14 pg/ml, TSH of 40.7 μIU/ml and normal hemogram. Extrapulmonary Aspergillosis has a high morbidity and mortality. Early recognition of these entities, prompt initiation of new, highly active antifungal therapies and adjunctive surgical management could improve the prognosis. Our case was treated surgically without any antifungal therapy. In conclusion, in our case, we found Aspergillosis in the thyroid of the patient who was operated for multinodular goiter. Our patient had no diabetes mellitus, alcoholism, past respiratory infection, immunodeficiency status and history of trauma. Clinicians should be aware of thyroidal invasion caused by Aspergillus hyphae in a healthy individual with multinodular goiter. 1. Buckingham SJ, Hansell DM. 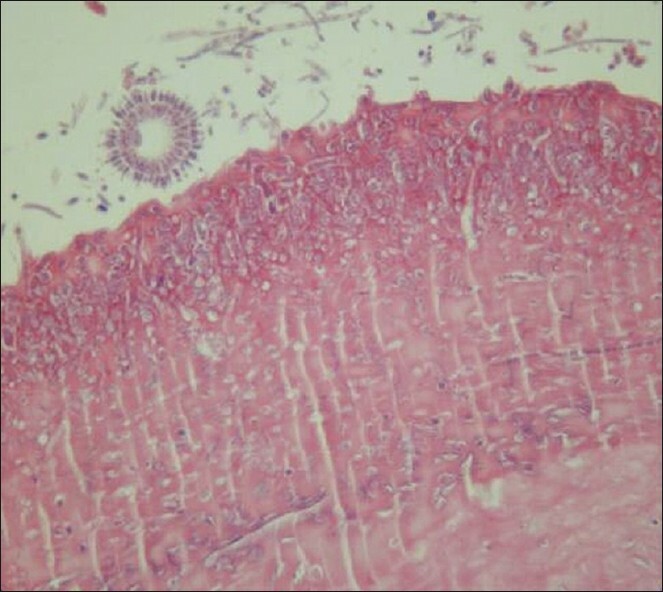 Aspergillus in the lung: Diverse and coincident forms. Eur Radiol 2003;13:1786-800. 2. Hornef MW, Schopohl J, Zietz C, Hallfeldt KK, Roggenkamp A, Gärtner R, et al. Thyrotoxicosis induced by thyroid involvement of disseminated Aspergillus fumigatus infection. J Clin Microbiol 2000;38:886-7. 3. Hori A, Kami M, Kishi Y, Machida U, Mastumura T, Kashima T. Clinical significance of extra-pulmonary involvement of invasive aspergillosis: A retrospective autopsy-based study of 107 patients. J Hosp Infect 2002;50:175-82. 4. Schweitzer VG, Olson NR. Thyroid abscess. Otolaryngol Head Neck Surg 1981;89:226-9. 5. Szego PL, Levy RP. Recurrent acute suppurative thyroiditis. Can Med Assoc J 1970;103:631-3. 6. Berger SA, Zonszein J, Villamena P, Mittman N. Infectious diseases of the thyroid gland. Rev Infect Dis 1983;5:108-22. 7. Goldani LZ, Zavascki AP, Maia AL. Fungal thyroiditis: An overview. Mycopathologia 2006;161:129-39.